Safe, Seamless, & Comprehensive Diagnostic Imaging… at No Additional Cost! Diagnostic imaging is key to providing your patients with the best possible care, but managing digital images on fractured systems limits its potential. Our built-in imaging system saves the day. No Switching Back and Forth! Our DICOM capabilities rival standalone imaging systems costing tens of thousands of dollars, yet we provide DICOM imaging at no additional cost! We can do this because unlike other systems, we designed our DICOM libraries in-house, from scratch, working directly from the 4,100-page standard. When we tested our DICOM at our first IHE Connectathon, we turned heads when it worked perfectly and they learned that we did it without relying on expensive third-party libraries. Since then, we have contributed our expertise to the advancement of IHE Eyecare, an interoperability effort lead by the American Academy of Ophthalmology. 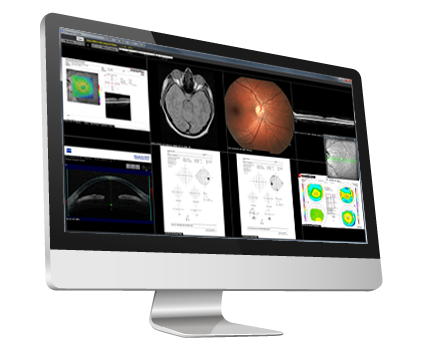 Although Ophthalmic DICOM IHE specifications have been available since 2012, previously used IHE specifications made it impractical for most clinics. Our contributions prompted the development of the Core Eye Care Workflow (C-EYECARE) profile in 2014, which our CEO co-authored. That effort then prompted the development of the Unified Eye Care Workflow (U-EYECARE) in 2016, which our CEO also contributed to. 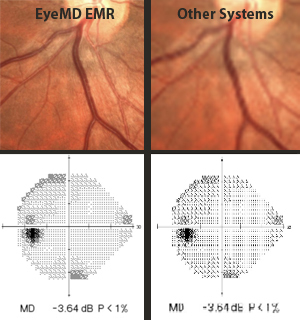 Ophthalmologists now enjoy practical DICOM implementations thanks to our contributions and the work of the IHE Eye Care Team. *Although DICOM is a vendor-neutral standard, implementations may vary. Please contact us for the latest information on specific devices. Other systems may not display images in their native format for various technical reasons. This can result in compression blur and pixelation which may cause you to lose important clinical details. Will this result in a missed diagnosis? 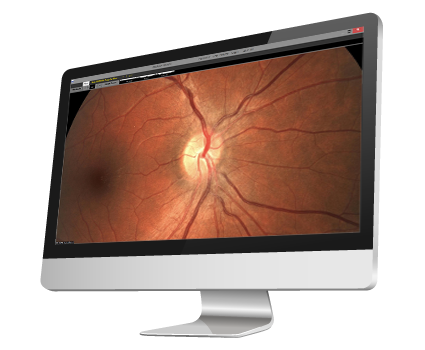 EyeMD EMR displays images in their native format and uses GDI Hardware Graphics Acceleration to render images. This results in blazing fast/stunning visuals that will make you more productive and will impress your patients. Eliminate manual entry by importing discrete data from Auto-Phoropters, Lensometers, Auto-Refractors, and more! The added bonus benefit of Client/Server EMR Systems is the ability to interface with real-time practice management systems and diagnostic test machines without the complication of cumbersome 3rd party tools and technology workarounds that could prove costly and unreliable.